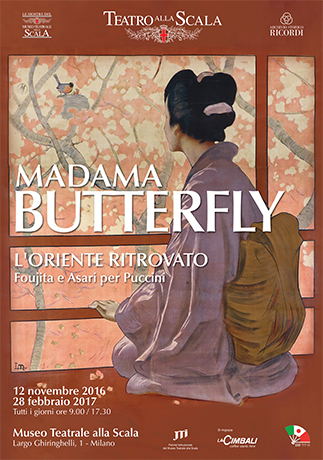 The exhibit will showcase the scenography for presentations of Madame Butterfly that took place from 1904 to 1985, documenting at the same time the tie between our theater and the various ‘faces’ of this masterpiece. Puccini wrote it for Piermarini’s La Scala, the performances saw on the podium the most eminent conductors of this theater, and the scenes were created by extraordinary artists. Thanks to the documents – such as scores, letters, photographs, libretti, drawings, sketches and little figures – belonging to the Historical Ricordi Archive (Archivio Storico Ricordi), visitors can get to know the fonts of inspiration that matured in Puccini his knowledge of a Japan ever less removed from him. The documents also allow a glimpse of the promotion of the opera generously supported by Giulio Ricordi and of the scenic realization of an Orient cautiously westernized. A year after the death of the composer, the luxurious scenography prepared by his friend, Arturo Toscanini, was signed by Caramba (1925). The version directed by Victor de Sabata (1951) had the opportunity to feature philologically prepared costumes created by the renowned artist, Foujita. The poetic version of 1985 signed by the trio Keita Asari, Ichiro Takada and Hanae Mori, and directed by Lorin Maazel (1985, presented, again, by Riccardo Chailly in 1992), introduced a vision at once traditional and daring of the Orient with Hanae Mori’s kimonos of glaring colors. The exhibit accompanies the visitor through the most disparate visions of a rediscovered Orient, inspired by the notes of Puccini’s struck girl.